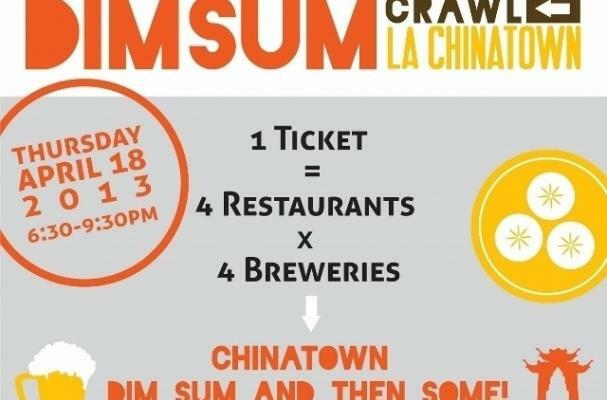 on April 18th, The Los Angeles dim sum crawl allows foodies to sample the cuisine from four restaurants while sippin' on brews for four local breweries. For those of you who aren't familiar with dim sum, it is a Chinese tradition where a variety of bite-sized steamed and fried dumplings are carted around the restaurant. Dim sum is typically eaten for brunch along with tea. Participating restaurants in the LA dim sum crawl include Empress Pavilion, Mandarin Chateau, Hop Woo and Plum Tree Inn. Tickets can be purchased online for $50 until April 14th and then $60 thereafter. Foodista readers will receive 10% off their ticket price when they enter the coupon code foodistafriends =).